These products plug lines and pumps that can interrupt service and cost thousands of dollars in time, repair and chemicals to remove these products from our wastewater system. The Village conducts Utility Billing on a bi-monthly basis. Inquiries regarding your water, sewer, and refuse bill or payment should be directed to the Water Department by calling 815-634-8149 x110 during the normal business hours 8:00 AM – 4:30 PM, Monday-Friday. Customers are billed on a bi-monthly basis for water, sewer, and refuse. All bills for service shall be rendered as of the first day of the month succeeding the period for which the service is provided and shall be payable not later than the close of business on the thirtieth (30th) day after the date of the bill. If payment has not been received within 30 days of the billing date, a penalty of 10% of the amount of the bill shall be added to your account. If your bill is more than 45 days delinquent, a service shut-off notice will be issued and service will be discontinued as of the date of the notice. Please contact the Water department at (815) 634-8149 to discuss payment arrangements; otherwise service will be discontinued. If service is interrupted for non-payment it will be restored only after all charges and reconnection fees have been paid. Customers (residents and businesses) should contact the Village if they notice a discrepancy between the readings on the inside meter and the outside remote register. Via Direct Debit – The required authorization agreement may be obtained at the Village Hall or may be downloaded here. A voided check indicating the bank account that is to be debited must be attached to the signed form. Direct Debit must be activated prior to a billing and the Village requires at least 30 days prior to a change in a direct debit bank account. The transaction will appear on your monthly bank statement and you will continue to receive Utility Bills from the Village indicating “Direct Debit” at the bottom of the bill. To enroll in Direct Debit Payment, please complete the direct debit form and submit form to the Village Hall. Questions, call 815-634-8149 for more information. Online – Please click here to utilize the online bill pay option. (https://www.epayillinois.com/Home/ShowSiteLandingPage/18380) The Village of Diamond is now enrolled in Illinois Treasurer’s Office E-Pay program. Residents can pay online using a debit or credit card. The first 10,000 gallons is billed at a base rate of $78.66 (bi-monthly). Any gallons exceeding 10,000 gallons for the two month period is billed at $9.48 per thousand gallons. Annual 5% rate increase effective on November billing. The first 4,000 gallons is billed at a base rate of $42.40 (bi-monthly). Any gallons exceeding 4,000 gallons for the two month period is billed at $1.83 per thousand gallons. Annual 5% rate increase effective on November billing. The sewer surcharge is to pay for the new Wastewater Treatment Plant and is $15.00 per month/$30.00 bi-monthly. As homes are built this charge will be re-evaluated and possibly reduced. Environmental Recycling & Disposal Service is the provider for refuse/recycling removal at a cost of $17.06 per month. Seniors over 65 years of age receive a $1.00 discount on refuse service per month. Garbage pick-up day is Thursday of every week. Please have all trash ready for pick up by 6:00am. Weeks with a holiday prior to or on your service day (Thursday) will have service delayed by one day. The following holidays are observed: New Year’s Day, Memorial Day, Fourth of July, Labor Day, Thanksgiving Day and Christmas Day. The contact number for NuWay Disposal is (877) 323-2222 . Watering is limited year round in accordance with Ordinance #2006-12. All properties with even numbered street numbers may use water on even numbered calendar dates and only between the hours of 6:00 a.m. to 10:00 a.m. and 6:00 p.m. to 10:00 p.m.
All properties with odd numbered street numbers may use water on odd numbered calendar dates and only between the hours of 6:00 a.m. to 10:00 a.m. and 6:00 p.m. to 10:00 p.m.
Water may be used for establishment of Sod and/or Seeded Turf Lawns planted in the then current year for a period of fourteen (14) days after the sod is laid or the seed planted. No person shall allow a continuous stream of water to run off into any gutter, ditch, drain or street inlet while using water for restricted purposes. If you have a water meter leak or detect a water main break, please contact the Village Hall as soon as possible. Please call (815) 634-8149 during business hours and (815) 634-8149 ext. 23 after hours or on weekends. On an annual basis the water & sewer bill will have a 5% increase that takes effect in October. Also, in accordance with the garbage contract, a garbage increase occurs in May every year. Use your water meter to check for leaks. Start by turning off all faucets and water-using appliances and make sure no one uses water during the testing period. Take a reading on your water meter, wait for about 30 minutes, and then take a second reading. If the dial has moved, you have a leak. Are you ready to chase down leaks? 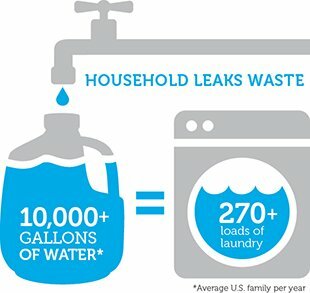 Household leaks can waste nearly 1 trillion gallons of water annually nationwide. Examine faucet gaskets and pipe fittings for any water on the outside of the pipe to check for surface leaks. Check the sink and bathtub faucets, replacing the rubber O-ring or washer inside the valve can usually repair dripping faucets. The most common source of leaks is the toilet. Check toilets for leaks by placing a few drops of food coloring in the tank. If after 15 minutes the dye shows up in the bowl, the toilet has a leak.Leaky toilets can usually be repaired inexpensively by replacing the flapper. Older toilets (installed prior to 1994) use 3.5 to 7 gallons (13 to 27 liters) of water per flush and as much as 20 gallons (76 liters) per person per day. Replacing an old toilet with a new model can save the typical household 7900 to 21,700 gallons (29,902 to 82,135 liters) of water per year. An average of 20% of toilets leak. Use a dishwasher—and when you do, make sure it’s fully loaded! The following chart describes the amount of water loss per month that would occur should your residence/business have a leak.